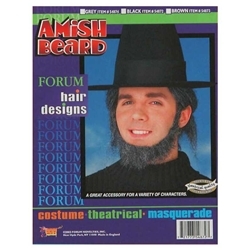 The Amish beard is available in Brown or Gray. Beard is self-adhesive. Whether you're building a barn, making wooden furniture, milking cows, or just dressing up, the Amish Beard is a versatile beard for many characters and uses. A great beard for pirates, inmates, farmers, and all manner of elderly characters.y.